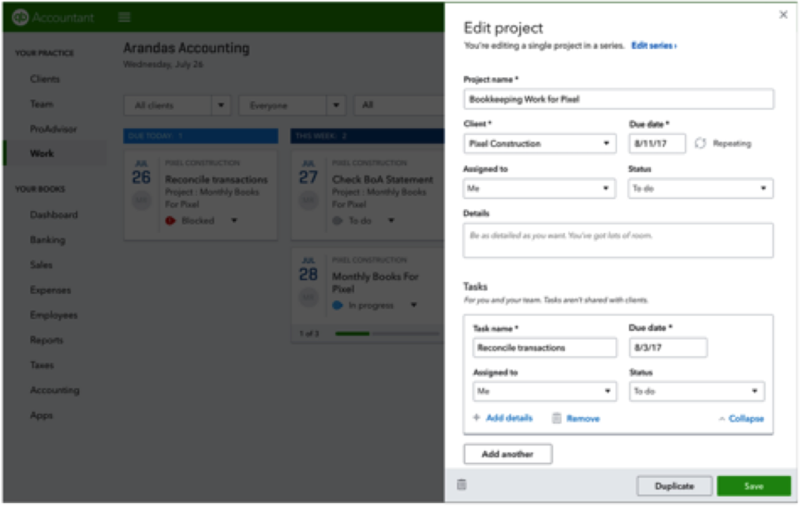 QuickBooks® Online Accountant recently launched several free integrated practice management features to help you manage your workflow, right from the new Work tab. These new features mark the start of an end-to-end practice management solution designed with you in mind. Take a quick video tour of the new features! You told us that one of the most frustrating parts of your job was manually scheduling repeating tasks you perform weekly, monthly, or yearly for the same clients, over and over again. We heard you, and with your help, we built a solution that’s available now. Meeting deadlines and managing to-dos is a snap when you create repeating projects on your schedule. Simply choose specific dates or days of the week, and set the frequency intervals—weekly, monthly, or yearly—just like that. 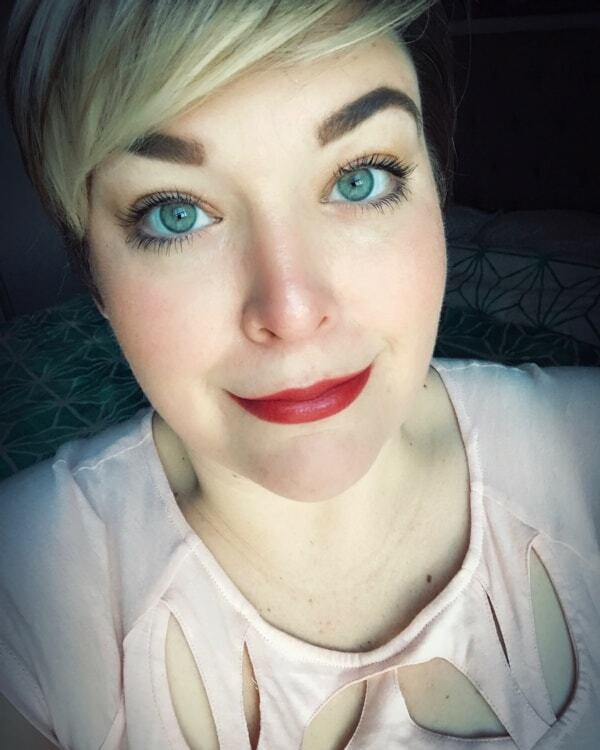 If you need to make changes to a project, that’s easy too. Whether you need to edit one specific occurrence or an entire series, your changes are updated and saved with just one click. 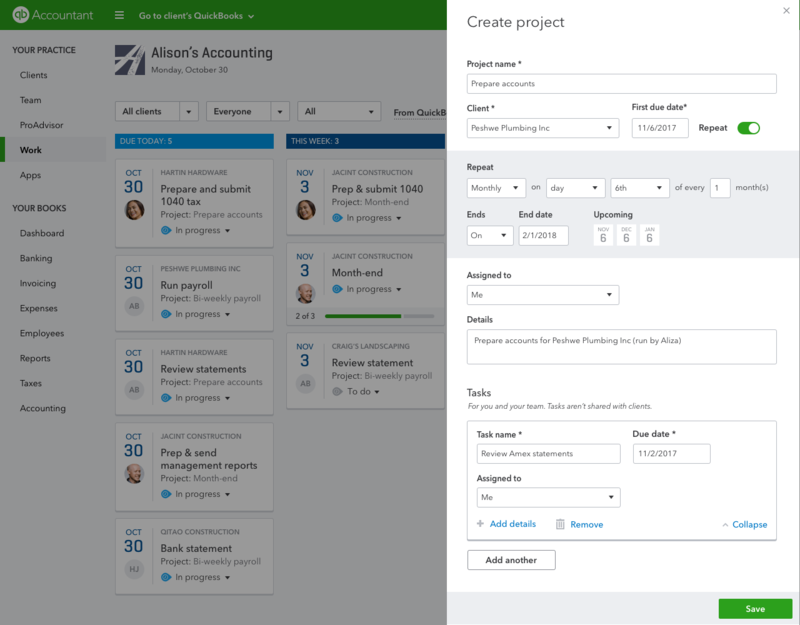 The new practice management features in QuickBooks Online Accountant make it easier than ever to do all your work, manage all your clients, and stay organized in one place. Take advantage of time-saving tools to help you stay on top of deadlines and give you peace of mind that nothing will fall through the cracks across all your projects—including repeating ones. We’re excited to provide partners like you with the tool you’ve been asking for, but we’re not stopping here. Stay tuned for more enhancements and updates as we continue to reimagine QuickBooks Online Accountant and make it the one place for all your work.